Martha's, Cut-Throat's, and LG4NB's garden photos remind me that I've been trying to improve my knowledge of a mystery plant. I've e-mailed photos to UH's Tropical Agriculture College, a horticulture society, and the highway dept but no one has bothered to respond. * I was griping about this to spouse when she asked "What do the ERs think? "* Well, (*headsmack*) duh. * I should've thought of asking you guys months ago. To prevent slow down the weeds from invading our back yard, we've been planting bougainvillea and this tree below (outside of) our property line. The tree has leaves like a podocarpis but I've never seen the flowers & fruits/seeds before. Both plants grow on neglected highway medians all over the state so I know they don't need water or care. I've never seen one looking sickly or dead. The tree's fruit/seeds drop & roll downhill to propagate without any help from us, and they don't come uphill to further invade our yard. They grow as tall as 15 feet, almost perpetually in bloom & fruit, but I usually see them about 8-10 feet. The tree in this picture is about seven feet tall and four years old. If things go according to my plan then in the next decade this tree will shade out the haole koa & the jungle grass that have been invading the rest of our property. So, can anyone tell me what it is? Re: Have you seen this shrub/tree? Does it flower? Does the fruit ripen to another color? sorry, not familiar. i like how the flower hangs simlar to the hallucinogenic datura plant. i'd suggest sending your pics to our local agrcultural extension service but i'm aware so much on hawaii is native only to there. you should bring a sample in person to a master gardener at your local office. 3rd from the left resembles a brugmancia, though can't make out enough detail. Do the flowers hang down and have a trumpet-like shape? The fruit starts out as dark green, lightens up as it grows to about 2" diameter, falls off, and turns black as the seed germinates. Yes, the trumpet-shaped flowers do hang like a brugmancia. * They're only 2-3" long and maybe 1-2" across the mouth. * But the bees think they're yummy. From what I can see on Google images the brugmancia doesn't have leaves like a podocarpis. Well, the ag extension is UH. That didn't work out the first time. 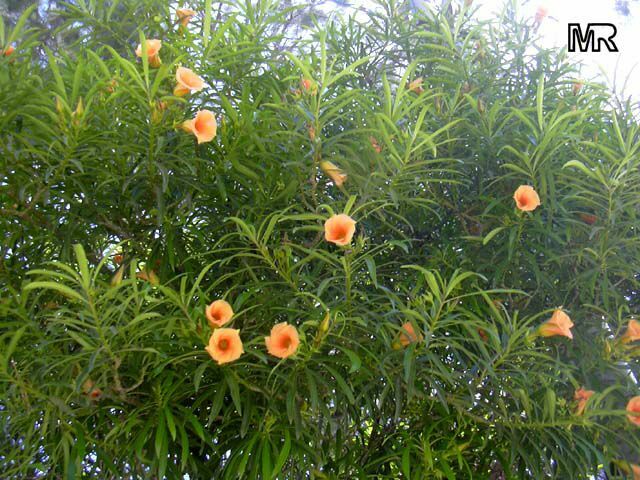 the cascabela thevetia, or the "be still tree?" Could it be: the cascabela thevetia, or the "be still tree?" Damn you're good. Thank you!! Yes, there's plenty of white sap. I didn't realize it's poisonous. It's either "be still or thevetia nereifolia, which all look like different names for the same thing. I'm planting oleander?!? Make sense, given how it thrives on neglect. How did you do that so fast? I've unsuccessfully tried search terms like podocarpis, orange flower, green pod, and so on. I found thousands of UH images from their botany curriculum, but I never realized the professors had similar pages. I've been able to identify trees using google, you just have to trial-and-error your way through various combinations of characteristics like leaves, fruit, sexuality, bark, etc. After narrowing down possibilities, you can check a few out with image searches, then go back and re-refine if you realize you're on a wrong track. Or, if you're more knowledgable and used to printed plant guides, you can try to identify things by looking through various appropriate sites/books. Martha beat me to this one, but I was at work! P.S. Martha, what kind of flower was that one in your old avatar? Hey, I am at work too. I just finished my comments on a salt production contract and now am going to do an assignment and control agreement. All because of you Dood I changed my Avatar. For now. Are you sure it's not Pakalolo? Well, I'm better at some kinds of plant identification than others, and extensive testing had already ruled out that possibility! In 1985 the Navy actually sent me to a one-week marijuana identification school. Back then we were required to be credibly expert in our opinion that we observed someone smoking dope, so we had to be trained. Of course that logic didn't extend to cocaine or a host of other substances, but luckily I wasn't selected for urinalysis training. If it's in the oleander family, the flowers are like none other I have seen either in Fla or Az - always have these small, upright or lateral beautiful flowers. But the leaves are clearly like my oleanders. I'd reinforce the warning about being poisonous. It's a neurotoxin and present in all parts of the plant. My friend's dog got into chewing the leaves on his oleander one time. Came back completely goofy - foaming, eyes flicking back and forth (nystagmus), vomiting and almost died. I'd take that warning seriously. I guess that is why the family Apocynaceae is also called Dogbane. Cool looking tree. I wonder if it would survive in the Washington DC area? It would be interesting to plant it in the same area where I have a Japanese Knotweed problem, and see which one wins out!